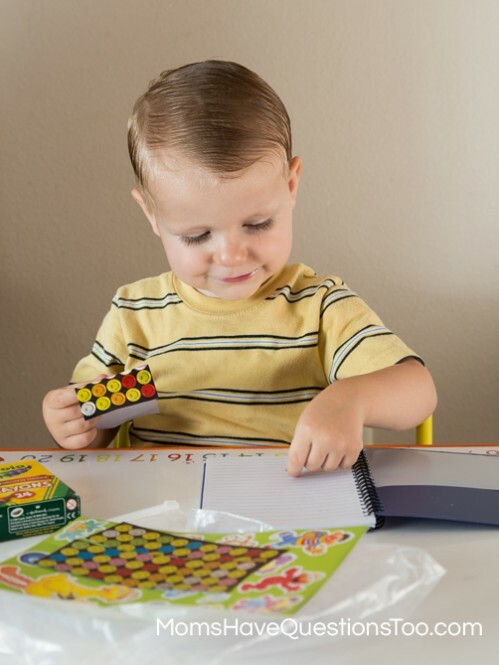 What is a toddler busy bag that will keep my child busy for a road trip or at home? 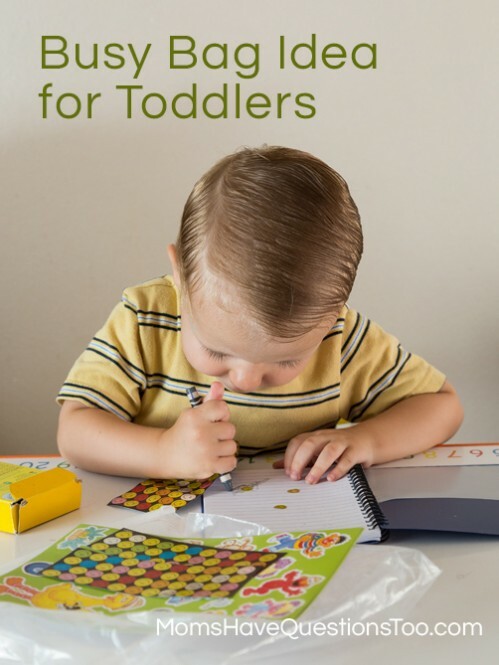 I am starting a new toddler series today and I am so, so, SO excited about it! The theme is busy bags!!! Okay, maybe not everyone gets as excited as I do about busy bags, but you should because they are extremely awesome. I was introduced to the idea of busy bags just over a year ago. 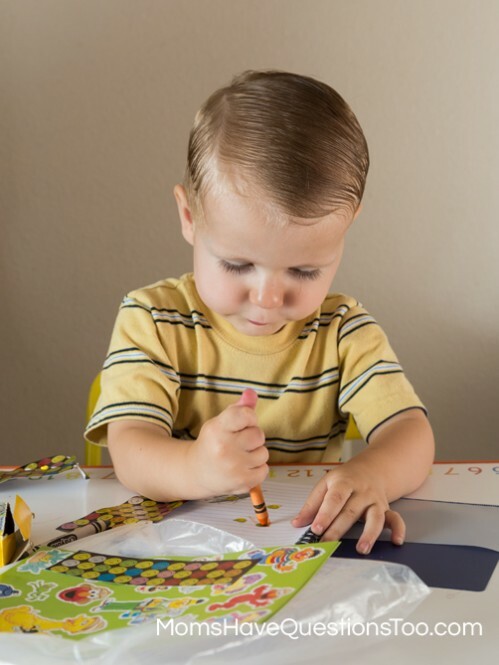 Basically, a toddler busy bag has an activity in a bag (or a box, or folder, or something) that will keep your child busy for awhile. 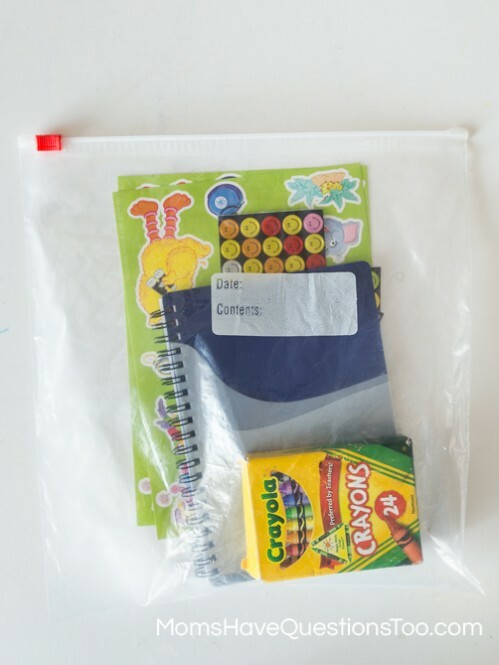 Most busy bags are child-directed which means your toddler doesn’t need your help to use the toddler busy bag. So, why am I so excited about doing a busy bag series? Two words: new baby. I’ll have a brand new baby by the end of the year who will need lots of my time and attention. I know Smiley Man will be competing for my attention, especially while I am nursing. Instead of dealing with the problem when it comes (a.k.a. as soon as the baby is born), I am dealing with the problem now by creating a bunch of fun busy bags for Smiley Man. These will be his special busy bags to use while I am nursing. Hopefully that will make him less rambunctious, jealous, destructive, etc. while I am nursing. Of course, even if you are not a nursing mother, busy bags can be extremely helpful for your toddler (and by your toddler, I mean you). Right now I have several busy bags for Smiley Man and Little Bear. 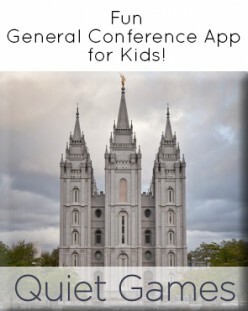 We mostly use them at church and during quiet time, but they are also great for road trips with kids, at a doctor’s office, while you are making dinner, or anytime you just need a break and don’t want to turn the T.V. on. Trust me, toddler busy bags are worth their weight in gold. The first busy bag I will share with you is probably as easy as it gets. In a gallon sized zip lock bag I put a couple sheets of stickers, a box of crayons, and a brand new cute notebook from the dollar store. Smiley Man loves stickers right now, so this bag is sure to keep him busy for awhile. I bought the brand new notebook to make the busy bag extra special and I got the box of crayons during back to school sales. Even though this idea is super simple, I’m guessing this toddler busy bag will get the most use after my baby is born.